Communicate effectively within the evolving context of international shipping. Act in a responsible, productive and professional manner, thereby promoting productive citizenship. Analyse and apply national and international legislation to promote the protection of the marine environment and legal issues as they relate to the carriage of goods by sea. Multi-national and multi-cultural crews are the hallmark of modern shipping. Desired personal qualities include: an appreciation of cultural diversity; the ability to work in a team and independently; communicate effectively; hardworking; work under pressure and adaptable to change. A sea-going career is a rewarding one that affords one to travel, earn tax-free salary and take on responsibility at a young age. However it is a dangerous environment demanding long working hours as the shipping industry operates 24-hours a day, 365 days a year. It requires discipline and the highest standards of safety; coupled with long periods away from home. Communicates effectively within the evolving context of international shipping. Acts in a responsible, productive and professional manner. Analyses the key national and international legal issues as they relate to the carriage of goods by sea. Understands the links between organisations, management practices and the business environment. iii) a National (Vocational) Level 4 with statutory requirements for a diploma entrance and the following subjects at the stated minimum ratings. Desired personal qualities include: an appreciation of cultural diversity; the ability to work in a team and independently; communicate effectively; hardworking; work under pressure and adaptable to change. 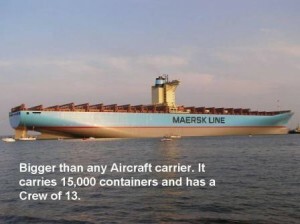 The shipping industry operates 24-hours a day, 365 days a year. It requires discipline and the highest standards of safety; coupled with long working hours.